Orthodontic Treatment is a type of treatment that uses orthodontic devices to straighten malpositioned teeth and misaligned jaws. It is done by a specialist- orthodontist and it can have a great influence on a person’s appearance, oral functions, and health. 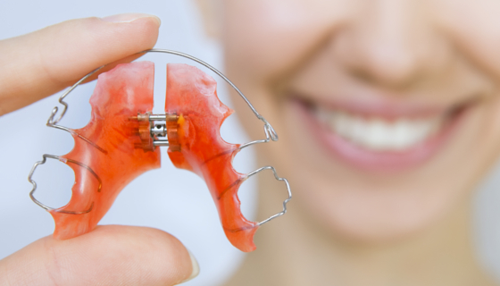 The appliances that are used in orthodontics can be fixed or removable. The most commonly used orthodontic devices are the fixed braces which are consisted of orthodontic brackets and wire. The brackets can be metal or clear. Special fixed appliances are used to improve improper oral functions such as thumb sucking. Another type of fixed appliance is the space maintainer used usually for premature tooth loss. In the removable appliances, the most popular ones are the clear aligners. The most common conditions that require orthodontic treatment are crowded and crooked teeth, overbite, crossbite and more. Everyone that has any type of malocclusion can get an orthodontic treatment. Since almost no one is born with perfect teeth, almost all of us need some orthodontic help. When it comes to malocclusions there is a number of them including misalignment of the jaws, crowding, spacing, overbite, underbite, crossbite, open bite, misplaced midlines and more. The orthodontic appliances can be fixed or mobile. Removable appliances are usually indicated for a younger age and can treat a number of problems. Kids often have problems with bad habits, so the functional removable appliances can help with that. Space maintainers are also commonly used for kids, to keep the space between two teeth. Sometimes kids lose their deciduous teeth prematurely, so they need a space maintainer to keep the distance. The same thing applies to permanent teeth. Other removable appliances are lip and cheek bumpers, jaw repositioning appliances, removable clear aligners, retainers, palatal expanders, headgear and more. Fixed appliances can treat all types of malocclusions including the more severe types. Fixed braces are the appliances we’ve all seen and heard of. We’re talking about the most commonly used orthodontic appliance. They are indicated for a number of conditions. Fixed braces can be metal or porcelain. They are made of brackets that are placed on the teeth. Other parts include archwires, bands, ligatures and more. The brackets can be located on the vestibular or lingual surface of the teeth. These are two separate techniques. A lot of people are bothered by the look of braces on their teeth, so decide to get them on the lingual surfaces. That way the braces are barely visible. The length of the treatment can last from 6 months up to 30, depending on the case. During that time, the patient will have checkups every month. The braces are fixed on the teeth, so the patient will have to eat, talk and do everything with the braces on until the treatment is done. Great oral hygiene is required. After the treatment, the patient will be given a clear retainer, removable. Special fixed appliances are used to treat several bad habits. They are fixed on the teeth and are removed once the treatment is done. Fixed space maintainers do the same job as the mobile ones, with the only difference that the patient can’t take them off.